Kitted up like an oversized eel at the base of the picture perfect Pitons, I started to wonder what had come over me. There I was, swanning around in the Caribbean Sea, donning a pair of snazzy fins and a wetsuit, and all that was rushing through my brain was the ‘999’ hand signal alert in case I needed to do an Ariel (à la The Little Mermaid) and break free from the boundaries of the sea. Unless I’m allowed to include Brighton on my CV of sea swimming then my resume was completely bare and so, I was petrified. We’d decided to take our first dive within the realms of our hotel due to the area’s incredible natural beauty (we were about to go under in an area which had been declared an UNESCO World Heritage site). We had a prelim on land informing us about the ins and outs of the world of scuba, from the types of fish to spot, to how to communicate with our instructor underwater. 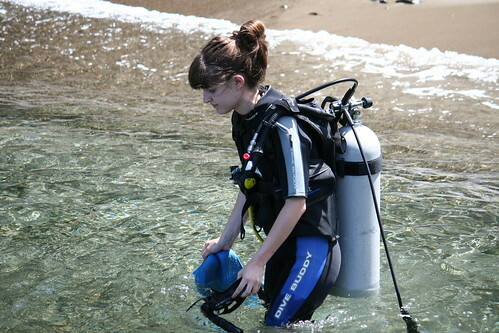 Amid the trepidation, I felt like a freshly graduated sea genius. My aim was to find Nemo, spot a seahorse and float among the beautiful briny, and after talking myself up to commit to something which had always been a dream of mine, I was finally sporting my scuba gear and ready to roll (read: float). The crystal clear sea lapped at our torsos as we became acclimatised to supporting the tanks on our backs, and once we’d mastered breathing with our mouth pieces in, we began to descend. Our small group of four was instructed to equalise (scuba talk for blowing out and popping your ears to avoid a build up of pressure) with each metre we gained. Before we knew it we were at least forty feet deep. For a second, my heart sunk. What was I doing?! Why was I putting myself through this? It took me a good second or two to realise that I was actually breathing underwater, that I was safe, and shock horror: I wasn’t about to be the dish of the day to a human-hungry shark. Once my brief sense of panic had passed, the beauty of the blue hit me – and hard. I’ll never forget that overwhelming feeling which struck me deep below sea level. Tropical fish aplenty rushed by our side, brushing past us as if we were part of the furniture while we gazed on in wonder at the magnitude of what we were witnessing. It was like we were on a different planet all together, and we were NASA astronauts floating around, about to discover a new species. With the adrenaline and our confidence booming, we all began to float further downward, squeezing ourselves between puzzling luminous coral shapes which lay before us. There we spotted our first of many sea spiders. On land anything with eight legs qualifies as being my mortal enemy, but its floating cousin seemed all the more friendly as it bobbed around and jumped between our hands to say hello. The highlight of our trip? Spotting a seahorse between the cracks of the coral, and galloping around the pink bobbled rock to find its mate. After a pause she came, and while I looked on in fascination bubbles flew out of her snout – she was saying hello. In what seemed like slow motion the seahorses bounced in grace, and before I knew it the pair had wadded off into the sunset (read: mysterious blue) and finally, all was well. Read more about Laura’s adventures on her blog, exploredujour.com. 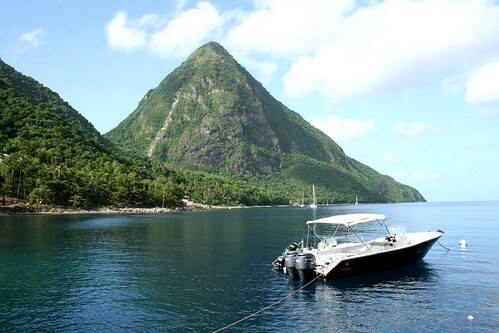 Fancy a spot of St Lucia scuba for yourself? Take advantage of our worldwide airfare sale and head there on the cheap: St Lucia flights on sale from £531 (selling fast! ).